This Handbook represents the first comprehensive collection of research on communication and people with disabilities. The editors have brought together original contributions focusing on the identity, social, and relationship adjustments faced by people with disabilities and those with whom they relate. Essays report on topics across the communication spectrum--interpersonal and relationship issues, people with disabilities in organizational settings, disability and culture, media and technologies, communication issues as they impact specific types of disabilities--and establish a future agenda for communication and disability research. Each chapter provides a state-of-the-art literature review, practical applications of the material, and keywords and discussion questions to facilitate classroom use. In providing an outlet for current research on communication and disability issues, this unique collection contributes to the lives of people with and without disabilities, helping them to improve their own communication and relationships. Intended for readers in communication, psychology, sociology, rehabilitation, social work, special education, gerontology, and related disciplines, this handbook is certain to augment further theory and research, as well as offer insights for both personal and professional relationships. Contents: Preface. T.L. Thompson, Introduction: A History of Communication and Disability Research: The Way We Were. Part I: Interpersonal and Relationship Issues. D.O. Braithwaite, L.M. Harter, Communication and the Management of Dialectical Tensions in the Personal Relationships of People With Disabilities. S.A. Nemeth, Society, Sexuality, and Disabled/Ablebodied Romantic Relationships. T-P. Do, P. Geist, Embodiment and Dis-Embodiment: Identity Trans-Formation of Persons With Physical Disabilities. K.P. Soule, M.E. Roloff, Help Between Persons With and Without Disabilities From a Resource Theory Perspective. S.M. Westhaver, Opening Up Spaces for Difference Via a Feminist Phenomenological Approach to Disability. Part II: People With Disabilities in Organizational Settings. I. Malian, A. Nevin, Effective Communication to Enhance Special Education. D.W. Worley, Communication and Students With Disabilities on College Campuses. A.L. Colvert, J.W. Smith, What Is Reasonable? Workplace Communication and People Who Are Disabled. K.P. Herold, Communication Strategies in Employment Interviews for Applicants With Disabilities. G.L. Kreps, Disability and Culture: Effects on Multicultural Relations in Modern Organizations. Part III: Disability and Culture. S.A. Fox, H. Giles, M.P. Orbe, R.Y. Bourhis, Interability Communication: Theoretical Perspectives. G. Merrigan, Negotiating Personal Identities Among People With and Without Identified Disabilities: The Role of Identity Management. M. Iwakuma, J.F. Nussbaum, Intercultural Views of People With Disabilities in Asia and Africa. K. Shultz, Deaf Activists in the Rhetorical Transformation of the Construct of Disability. Part IV: Media and Technologies. B. Haller, If They Limp, They Lead? News Representations and the Hierarchy of Disability Images. K. Wolfson, M.F. Norden, Film Images of People With Disabilities. O. Farnall, Invisible No More: Advertising and People With Disabilities. S.A. Fox, The Uses and Abuses of Computer-Mediated Communication in People With Disabilities. Part V: Communication Issues as They Impact Specific Types of Disabilities. R. Parrott, T. Stuart, A.B. Cairns, Reducing Uncertainty Through Communication During Adjustment to Disability: Living With Spinal Cord Injury. A. McIntosh, When the Deaf and Hearing Interact: Communication Features, Relationships, and Disability Issues. H.M. Rose, A.R. Smith, Sighting Sound/Sounding Sight: The "Violence" of Deaf-Hearing Communication. J.W. Smith, K.P. Kandath, Communication and the Blind or Visually Impaired. C.K. Matthews, N.G. Harrington, Invisible Disability. B.B. Whaley, M.A. Golden, Communicating With Persons Who Stutter: Perceptions and Strategies. M.A. Romski, R.A. Sevcik, Children and Adults Who Experience Difficulty With Speech. A. Weitzel, Overcoming Loss of Voice. R.J. Cline, N.J. McKenzie, Interpersonal Roulette and HIV/AIDS as Disability: Stigma and Social Support in Tension. J. Knuf, The Margins of Communication: Coping With Adult Dementia. Part VI: Setting a Future Agenda for Communication and Disability Research. D.O. Braithwaite, T.L. Thompson, Communication and Disability Research: A Productive Past and a Bright Future. "This book can truly be said to be one of a kind....anyone who reads the entire book will come away with a better understanding of the many nuances, issues, and practicalities involved in successful interactions between those with and without disabilities." "...the first comprehensive collection of communication research concerning the disabled....the editors have done all of us a service with this handbook of research findings and questions as yet unanswered." 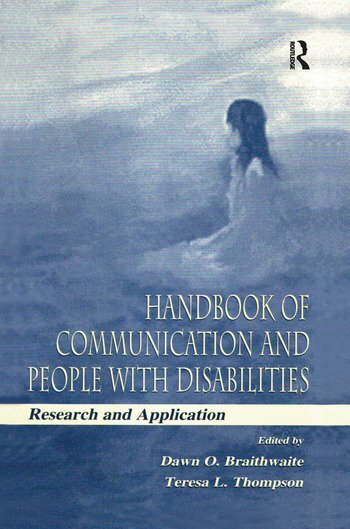 "Handbook of Communication and People With Disabilities is a landmark book....[it] will be useful to scholars interested in communication questions around disability, for it provides a valuable sampling of many of the kinds of work that communication scholars are doing in this area. It will be of particular value as a textbook for the growing number of classes exploring communication and disability. More importantly, however, the book makes a significant contribution to disability studies because it highlights communication as a crucial factor in the social construction of disability." "This groundbreaking collection stands as an important accomplishment for scholars in communication disciplines whose work engages issues related to disability and begins to fill a significant void in communication research....Readers...will be rewarded with a wealth of serious scholarship and critical insight."